Ernie is passionate about his winery and creating a wine business that strives for excellence and relevance in both domestic and international wine markets. As a leading South African ambassador and one of the most recognizable faces in the world of sport, Ernie Els has long demonstrated a passion for excellence. His focus, discipline and commitment have led to extraordinary golf success, and these same qualities are evident in Ernie Els Wines. Through his many travels around the globe Ernie has been exposed to and appreciated some of the world’s greatest wines and in 1999 decided to pursue this passion for fine wine with the creation of Ernie Els Wines. 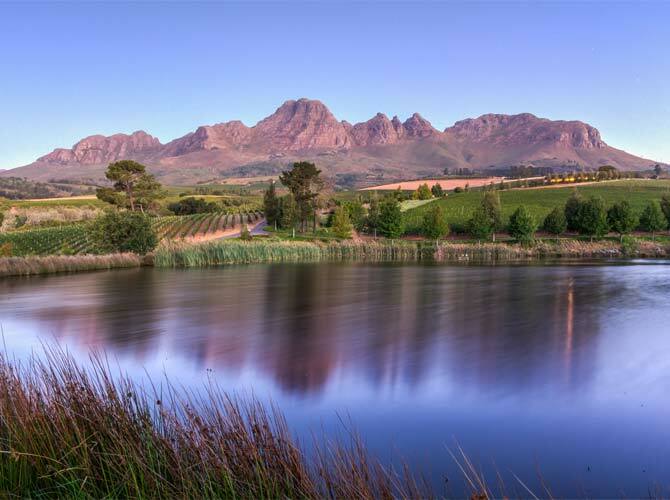 Ernie befittingly chose Stellenbosch, the noble heart of South African wine to base his operation. We invite you to share his vision, and with that, Welcome to Ernie Els Wines! The winery has 72 hectares under vines, and is situated in the Helderberg region within the Stellenbosch appellation. The Estate grows Cabernet Sauvignon, Merlot, Petit Verdot, Malbec, Cabernet Franc and Shiraz. Each variety is separately managed to create unique and varied flavour profiles. The warm, north-facing slopes deliver rich, full bodied red wines. With an altitude of approximately 250 metres above sea level and the cooling influence of the Atlantic Ocean just 15 kilometres away, the ripening period is extended by up to 3 weeks. The grapes are hand-picked in the cool of the early morning. All wines are aged in 300 litre French Oak barrels for between 14 and 18 months. Perhaps the most serious Ernie Els Signature yet, the 2011 is a brooding, powerful Bordeaux-style blend. Predominantly Cabernet Sauvignon, the purple edge and pitch black core immediately points to its unwavering nature and shadowing depth. Time in the glass uncovers notes of candied orange, cardamom, clove and dark olives, leading to an intense palate that shines with graphite and cassis. It has a towering structure built on a foundation of crunchy tannins and pure fruit, all solidified by fine yet spicy oak. Long and rewarding, the tail finally ends with a touch of salted liquorice. This is best cellared for 5 to 10 years as the heady tannins integrate further. 2012 was a brilliant Stellenbosch vintage and the Proprietor’s Blend takes advantage of the full ripeness, freshness and hauntingly rich tannins offered by the conditions. The nose abounds with dark-blue fruits, a hint of bacon, espresso and fig jam. Classy oak notes and a touch of truffle further tussle with the amazing fruit purity. The palate shows beguiling inky-black cassis from the Cabernet Sauvignon, providing fleshy tannins, a rock-solid core palate and towering structure. The large Shiraz component adds a spicy complexity and exotic edge, whilst the sprinkle of remaining Bordeaux varieties give finesse and depth. Roast beef and sugar-coated blueberries line the intense yet fleshy finish. Will age well for a decade of more. The 2012 Proprietor’s Syrah immediately leaps from the glass with layers of mocha, cinnamon and dense spicy fruit. The palate shows a contrast of dried sage over maraschino cherry in an exotic, graphite-like body. Rich, glossy black and blueberry fruits stain the glass, offering powerful depth against the backdrop of mouth-coating, succulent tannins. The finish is bold and lingers for minutes with primary red fruits and a hint of fine espresso foam. Impressive now, expect 3-5 years to add more complexity and fine balance. This classy 2011 Cabernet Sauvignon comes across with striking purity. It is once again richly concentrated and yet remarkably elegant and refined. Purple hued and powerfully built, its components are seamlessly knitted into a cassis-fruited, superbly layered palate. Hints of black cherries, dark chocolate, graphite and apricots are all balanced by its subtle oak support. The immense purity of fruit fits like a jigsaw into the perfectly chiseled, tannic frame. Finally finishing with inviting freshness and lacy tannins, this wonderful wine will evolve for a decade or more. The 2012 Cabernet Sauvignon boasts an inky blue black core and explosive purple rim. Extravagant salty-liquorice notes appear on the nose, intertwined with pine kernel, a dash of Madagascan pepper corn and lashes of blueberry fruit. The palate is medium to full-bodied with a firm acidity and supple yet lacy tannins. Elegantly modern with a somewhat towering structure, the wine finally finishes with a sweet fruit guise, a touch of mint and deft yet spicy oak. The 2014 Sauvignon Blanc shows zingy, bright, tropical fruits that abound from the nose and palate. A mélange of guava, pineapple and lemon curd lead to a medium bodied but intensely flavoured, textured palate. Hints of wet earth and bell pepper give complexity and depth, albeit in a soft and comforting manor. The linear finish shows a mineral, gravelly edge that balances the pure-fruited stance. This is amazingly open and entertaining while young and shows the terrific 2014 vintage. As the name suggests the Big Easy is bold in flavour and yet easy in demeanour. Pure, ripe, purple and red fruits immediately leap out the glass in an array of complexity, amplified by hints of rose-petals and boiled sweets. Warm notes of milk chocolate and roasted coffee round off wonderful complexity and depth. The Syrah dominated palate is juicy and succulent with the Cabernet Sauvignon backbone providing an inky structure. A dash of Rhône varieties give a dried, provincial-herb edge to the exquisitely balanced finish. The Big Easy is 100% Chenin Blanc from various low-yielding vineyards across the Western Cape. It opens with sun-kissed daisies, honey-suckle, cantaloupe and kumquat notes. This upbeat and complex nose leads to a more mineral and serious palate, that exudes elegance and poise. Two months of lees aging gives added depth, as well as contributes to a round, comforting and soft texture. Medium bodied with a racy finish, this Chenin Blanc is typically easy and rather delicious even in its youth. The Big Easy Rosé shows off-pink hues and a crystalline salmon core. Made from 100% Syrah, it offers notes of dried flowers, cured bacon and fruit pastels. The mid-palate is light, soft and round, finishing with a pleasingly dry, lemony-fresh tail.